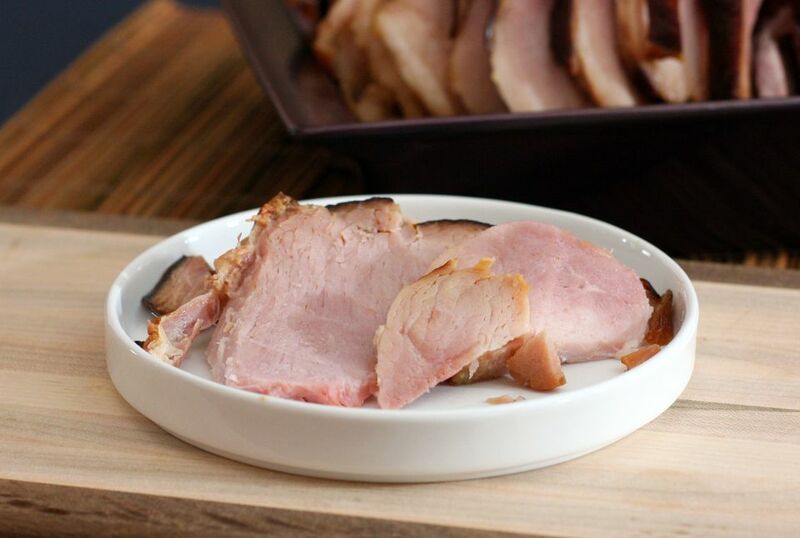 This baked ham is finished with a lightly spiced brown sugar and mustard glaze mixture. It's a sweet-sour combination, giving the ham excellent flavor. This is a tasty glazed baked ham, perfect for a big holiday dinner or Sunday gathering. Heat oven to 325 F. Line a roasting pan with foil. Wrap the ham in foil, keeping the ham fat side up; place it in the baking pan. Bake for 18 to 20 minutes per pound, or until a meat thermometer or temperature probe registers about 145 F.
Meanwhile, make the glaze. In a medium saucepan, combine brown sugar, cinnamon, flour, mustard, and vinegar. Stir over medium-low heat until smooth. Add water and bring to a simmer. Simmer, stirring, for 1 minute. Remove the foil from the ham and remove excess fat. Score the ham all over the surface, creating a diamond pattern. Return to the oven and continue baking to about 155 to 160 F, basting with the glaze mixture frequently.